[Unofficial] 15.827 Ao12 using ZZ-CT: The LL-Skip Method. Back in 2009, I said something like, "in the future, people will be doing 1LLL methods", and we'd lol at 2 step LL, just like how we talk about wrist turning and suboptimal CF methods from the 1980s. We currently live in the future, so we need to go beyond the future OF the future. 1LLL isn't enough now, we need to LL skip everything. There's no limits, anything is possible. So yeah, I took a break from studying and got this on video! I had shaky hands, TONS of pauses and lockups, and my cube isn't great, but I think sub-15 should be doable soon. 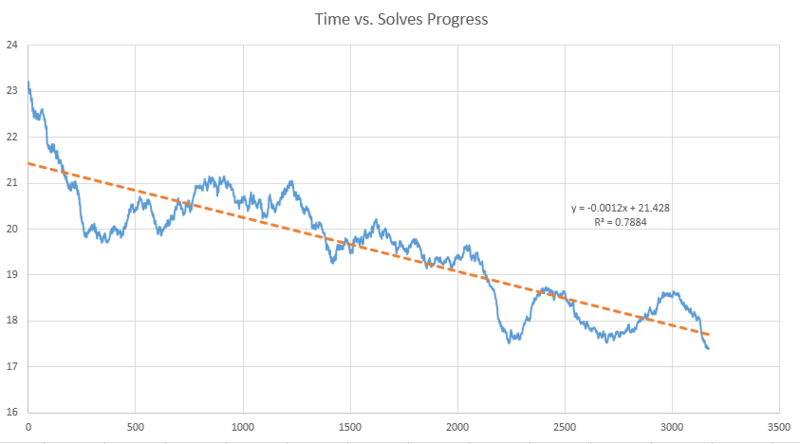 I've had almost linear progress going from 24->15 sec average with this method in the past 4000+ solves. I've only been doing this around a month, and this method has a lot of potential! I still need to get my algs down really good in my memory. ZZ-CT is a ZZ variant with a unique 2 look LSLL, divided into TSLE and TTLL. TTLL forces an LL Skip with only 72 cases (42 if you want to mirror). Easy recognition too! PLL occurs 20% of the time (1 out of 5 solves). Leading to a well known algorithm that most cubers already know. True LL skip (fully solved cube after TSLE) occurs 1 out of 360 solves (0.27%), which is multiple orders of magnitude greater than 0.0064% in CFOP(1 out of 15552 solves), and 0.051% in ZZ(1 out of 1944 solves). 2-Gen EVERYTHING occurs 29% of the time, which is twice as much as ZBLL (15% chance), and sixteen times greater than CFOP (1.8% chance). Individual TTLL probabilities are similar to OLL. In comparison, the statistics for ZBLL cases are profoundly lower. Some ZBLLs only pop up every few days, meaning that TTLL comparably requires much less practice to execute TTLL than ZBLL. TSLE is skipped 1 out of every 405 solves (0.24%), which adds another level of reduced single times. If you're curious, Gyroninja and I have been collaborating and will post algorithms soon! Gyroninja for his contributions to TSLE generating and tabulating algs. Phil Yu for morale boost by telling me my method was cool. Brest for giving me algorithm guidance and doing some generating for me. Sarah Strong and Stachu for making the CLS pictures that I used as reference. I have been following the creation of this method. This looks like a good one imo. You are a real inspiration, and I admire your dedication and motivation to cubing. Nice average, and it looks like there's still lots of room for improvement too. I can see this getting really fast - possibly one of the fastest ZZ variants. It will always be 2-gen in both orientations. Oh, really? I though there would be 1/6 of the cases 2-gen in one orientation and 1/6 in the other. I just generated my algs based on colours, and I just know it's 33% because the algs turned out that way. ZZ with ZBLL is about 2-3 moves less on average, and at the highest level of skill, with extreme practise and youth, I believe ZZ with ZBLL is faster on average. However, for lazy people without the time, skill, and youth, I think this is the ideal step above OLL/PLL with ZZ! It's a fun method when the crazy singles happen during an average, due to all the probabilities for a skipped or easy step! My favourite is whenever x (R' U R U')*3 comes up, because it's such a fast way to end a solve! I recommend this to moderately lazy ZZ cubists, simply because the singles that can occur are really fun. But for the truly competitive, I think ZZ-A is better. This will be my new main method soon, hands down. Until a better method comes out, which I don't think will happen for quite some time. Really hard to get past if you can't focus for your life, any suggestions?? I've just been trying TSLE and it seems possible to do intuitively in slow solves and flows quite nicely. Can't wait for the TTLL algs so I can try the full method. I'm not convinced by the probability of 2gen solves. My understanding is that the rest of the solve is 2-gen only if CP is solved after the first 2x2x3. That's got a 1 in 6 chance. Since this method only varies from standard ZZ after the 2x2x3, I don't see how the probability could be different. But how likely are the 2-gen cases to come up? I think it will be slightly different to 33%, even if that's the proportion of algs which are 2-gen. However I really don't know, so maybe you're right. Yep, I agree, it probably isn't as fast as ZZ-a. But it might be better than OCLL-PLL and COLL-EPLL - though I've not seen the algs yet. You can do a y' before TTLL and some cases will still be solvable with <R, U>, and since you've done a rotation it's not just 1/6. Ahhhh, TDM, I know what you mean about probability vs. alg percentages. Particularly in PLL and ZBLL. Qualitatively, I have no idea. I hope someone good with probabilities can clarify! I'm also happy that it's being well received so far, I put a lot of work into it! Nice work man. You'll be sub 15 with this method soon, can you taste it? I can't wait to start practicing next week, and use it at a comp this weekend. I don't understand most of that, but sounds cool. Good job! Exactly 30% are 2-gen in some orientation... In hindsight, I think it's because the only overlap between the 2-gen and 2-gen after a y' are the PLLs, and these make up 1/5 of the solved cases.. 1/6 + 1/6 - 1/(6*5) = 30%. Spoiler contains individual case probabilities as percentages. In terms of fractions, every case has a probability of either 1/90, 1/180 or 1/360. I don't know how you're representing the cases but I just numbered the corners 1-5 and the edges 1-4 and identified cases by which numbered corner or edge was in which location. Other than the PLLs, the cases are rotated so the D layer corner is in UBL. You can work out which case is which. Anyone got algs yet? Or are they somewhere obvious and I'm dumb? This was the part I wasn't sure about; I thought there would be other cases but wasn't confident. Interesting to know, thanks for sharing! Computational brute force to solve problems which otherwise would have involved critical thinking is something I REALLY appreciate. @Wiresandfires, I have the algs, but I currently want to redo like, 10 cases. I'm super busy with finals week at school right now though. My algs will probably be posted in June, but now that people know the concept, there's nothing stopping people from generating and learning for themselves if they wanted to.